For the 2014 model year, the Eos is getting more technology with VW’s Car-Net telematics system coming standard on every trim level. This will include security and convenience features, such as roadside assistance and remote vehicle access. The 2014 Eos give everyone the opportunity to let his or her hair down with a power folding, hardtop convertible with a sunroof build in. A side-view of the convertible might make you think that the Eos is actually a hardtop coupe but the distinct body lines make sure you know that there’s a little bit more to the car. The front façade with its rounded hood and almost smiling grille is very Volkswagen, making sure everyone knows who made the car on sight. A turbocharged 2.0-liter four-cylinder engine powers each 2014 Eos, getting 200 horsepower and 207 lb-ft of torque. This provides drivers with a spunky performance from the convertible, making it the prime candidate for road trips. Combined with the six-speed automated manual transmission, the powertrain allows for the Eos to accelerate from zero to 60 in an estimated 7.3 seconds. The EPA-estimated fuel economy for the 2014 Eos is a solid 25 mpg combined. Whether you’re bathing in the sunlight with the retractable roof down or staying in the shade, the cabin of the 2014 model year Eos gives off a classy vibe with high-quality materials and solid design. There isn’t much room in the backseat—a tradeoff for the hardtop roof and sloping, coupe-like design—but there’s more than enough room in the front seat and a decent amount of storage. 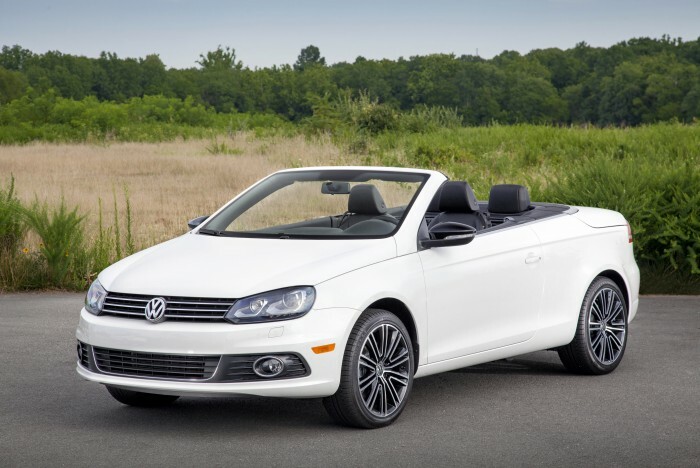 With the top rating of “Good” from the Insurance Institute for Highway Safety, the VW Eos is a safe car. Add the brand new standard Car-Net telematics system and the safety features keep on rising. Automatic crash notification, roadside assistance, remote vehicle access, stolen vehicle location, and geo-fencing all come with the telematics system, creating a sense of security for any 2014 Eos owner.